Over the weekend, the status of both red Nexus 5 models through Google Playswitched to “We are out of inventory.” Typically, we ignore these stock status changes as Google Play fluctuates regularly with inventory levels, but this time the “Please check back soon” message has stood up longer than usual. We aren’t sure if the red variant was a limited time release, if it sold quicker than Google had expected (less than a week), or if we just need to wait for someone to refresh the listing on a back-end to populate it with more phones. No matter what, the new colorway of the phone only seems to have added value to a phone that Google has ultimately been very pleased with. I can’t tell you how many times Google execs mentioned during their last earnings call that the Nexus program had done very well in the last quarter. LG even mentioned that the Nexus 5 helped carry their device sales in the final quarter of 2013. Does that sound like a program that Google would like to kill off? 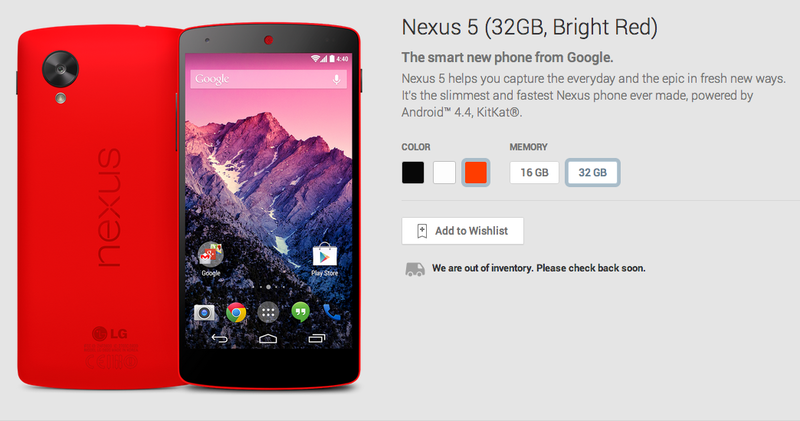 We unboxed the red Nexus 5 days after it was release because, well, that’s what we do with new Nexus products. It’s bright, it’s pretty (to us), and would have made a lovely Valentine’s present. To see the phone in action, hit up our video below. Did you miss out on the chance to pick one up?